I'm foregoing blogging for Holy Week, so I want to wish you a meaningful week of re-living the last days of Jesus' life leading us up to the climax of the Christian calendar, Easter Sunday. I always encourage people not to jump from Palm Sunday straight to Easter Sunday, but to seek to enter into the suffering of Christ in Gethsemane and Calvary. If your church doesn't offer Maundy Thursday or Good Friday services, I encourage you to seek them out at nearby churches. If you're from a non-denominational background, try a high-liturgy church for one of those services. Many of them are contemplative, quiet, and profound. Some churches have Tenebrae (darkness) services, in which they slowly turn out the lights at the end of the service, remembering the darkness that fell upon Jerusalem while Jesus hung on the cross. Historically, Christians have fasted from Thursday night until Sunday morning, and if that's extreme for you try fasting for Good Friday or Holy Saturday. It produces a longing, physically as well as spiritually, for the victory of the empty tomb on Sunday morning. 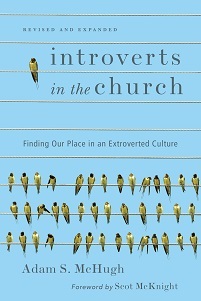 I've been conducting interviews with introverts in various ministries, which I will be posting in April. Check back often next month, and you will hear from youth pastor Lars Rood, church-planter Jamie Arpin-Ricci, missionary to Haiti and author of Following Jesus Through the Eye of a Needle Kent Annan, and introverted Pentecostal pastor (!) John Lathrop. I'm really excited for this series. In the weeks after Easter, I will be posting some interviews I'm currently conducting with introverts in various kinds of ministries. Currently, I have commitments from an introverted missionary, an introverted youth pastor, and an introverted church-planter. You can help me with this process by answering this: If you could ask any of these people questions about how their introversion interacts with their spheres of ministry, what would you ask? One of the great things about being a mainline Protestant with evangelical convictions is that my work gets coverage from a variety of theological circles. Carl McColman, a Catholic and self-proclaimed Christian mystic, asks "Why wasn't this book published thirty-some years ago?" He even goes so far to say that if he had read Introverts in the Church when he was younger, his spiritual and theological path may have looked different! Pastor Ron Edmonson has started a great discussion on his blog, called "How Introverts Handle Awkward Situations"
It's a good blog post, but I think the comments are even more intriguing, so be sure to read to the bottom. On a separate, less awkward note, I had the incredible experience yesterday of doing an interview with Ken Myers at Mars Hill Audio Journal. Our interview will be on the next edition of the journal. "The stereotype startup guy or gal is a high energy, always schmoozing, hard pitching and hand-shaking go-getter. But since 50 percent of the population are identified by psychological studies as introverts, that stereotype might need some examining." "I love seeing friends face-to-face. (Not in gangs, but one or two at a time.) I love Facebok. I love e-mail. I love letters, although it has admittedly been a while since I've written one. But I hate the phone. Hate it. Hate. It." Probably the biggest surprise I have received since publishing Introverts in the Church has been the reception of the book in Canada. The best theory I can come up with has to do with introverts and geography. I speculated about this a while back, but I'm working with this notion that the farther north you go from the equator the more introverts you will find (at least by percentage of the population). My theory goes like this: the colder the weather gets, the more time you are forced to spend indoors. Indoors is a world of privacy and solitude, where introverts shine. As the weather gets warmer people are out more, and outdoors is a world of social interaction, where introverts lose energy and enjoy less solitude. It's just a theory, and probably not a good one. I like my time indoors reading and writing for sure, but most of the time I'm inside I'm wishing I was on a golf course. Though I did hear once that Maine has the highest percentage of introverts in the American population, and as someone who has spent significant time in Seattle and in Los Angeles, I can say pretty confidently that Seattle is more introverted by nature. What do you think? Am I totally off my rocker? I just signed up for the Catalyst West conference in April, a large conference aimed at younger generations of pastors and church leaders. I'm very much looking forward to it. Interestingly, even though I prefer smaller churches, where I can more easily meet people over time as I see them week after week, I prefer larger conference settings. When I'm only going to be somewhere for two or three days, I enjoy the relative anonymity of that context. You'll usually find me in the bigger breakout sessions, where I don't feel pressured to share or participate much (other than listening, which contrary to popular belief is a very active kind of participation). And sometimes I'll duck out of the breakout sessions to find a quiet spot to read or else go off campus to a nearby coffee shop or wine bar. I also just sent an email to the Catalyst organizers, suggesting an "Introverts Corner" (to steal the term from a Psychology Today blog of the same name), a quiet and comfortable place where people can go to process, journal, rest, or access WiFi. We'll see what they say. Do you prefer larger or small conferences? What are your strategies for navigating the extroverted conference chaos? I started Introverted Church three years ago this month. It's been a fun challenge to come up with something to say about introverts and faith week after week, and I've been helped out a lot by many of you who have been reading since the beginning. 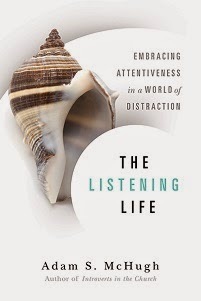 Some of your comments and input actually made it into my book. In their March issue, Presbyterians Today Magazine profiles this blog and how it became a platform for Introverts in the Church. I did an interview with the author, and she asked me what suggestions I would give to new bloggers and also for those bloggers who are hoping to get a book deal. Thanks to all of you for your loyalty, your insight, your comments, and for helping make Introverted Church and Introverts in the Church the success they have become!